A Cobb Salad is pretty simple to make. As a matter of fact most salads aren’t too complicated if you get the right ingredients and toss them together neatly. However, the Cobb Salad has a great story attached to it. Aside from the components of the salad there is a key element which does require a recipe, the special dressing. So, today, we’re going to tell the tale of the Cobb and show you how to make your salad shine just like The Brown Derby’s Cobb Salad in Disney’s Hollywood Studios. 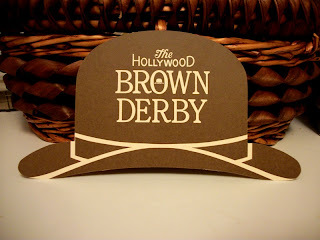 One night in 1937, Bob Cobb, then owner of The Brown Derby, prowled hungrily in his restaurant's kitchen for a snack. Opening the huge refrigerator, he pulled out this and that: a head of lettuce, an avocado, some romaine, watercress, tomatoes, some cold breast of chicken, a hard-boiled egg, chives, cheese and some old-fashioned French dressing. He started chopping. Added some crisp bacon, swiped from a busy chef. The Cobb salad was born. Sid Grauman, of Grauman's Chinese Theatre, was with Cobb that midnight, asked the next day for a 'Cobb Salad.' It was so good that it was put on the menu. It may seem kitschy, but I for one love the fact that The Brown Derby prints their recipe cards on miniature paper derbies. Is it still California Crazy if it’s not actually architecture? Call it what you will, but this dressing recipe is spectacular, and great on all sorts of salads, not just the Cobb for which it was created. Chop all greens very fine and arrange in a salad bowl. Cut tomatoes in half, remove seeds, and dice fine. Fine dice the turkey, avocado, and eggs. Arrange above ingredients, along with bleu cheese and bacon crumbles, in straight lines across the salad. Arrange chives diagonally across the topping lines. Present this at the table, toss the salad with dressing, and place on chilled plates. Garnish with radicchio cup and watercress. Blend together all ingredients, except oils. Add olive and salad oils, mix well again. Blend well before tossing with salad.